Our Fall 2016 SLAM on December 10th at Roam Galleria was one for the books. We kicked off the day with the first meeting of our revitalized Advisory Council. The room crackled with ideas as NMI alums and our closest allies put their heads together to envision the NMI’s future. 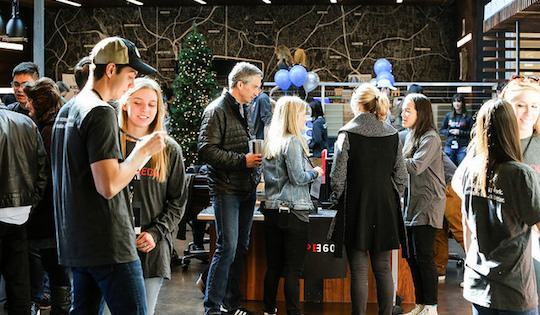 Later, over 50 students showed off innovative applications of an array of technologies – from iMessage-ready UGA football stickers to Apple Watch-guided meditation to a very realistic (and at times scary) VR-based video game. We were thrilled to see so many familiar faces across industries, and we hope you were as impressed with these projects as we were. Special thanks to the sponsors who made it all possible: the Grady College of Journalism and Mass Communication and HW Creative Marketing. And finally, thanks to Roam Galleria for hosting us in their amazing and inspiring shared working space. Photos from SLAM can be found on both our Facebook and Flickr. And, don’t forget to mark your calendar for the NMI’s Spring 2017 SLAM! We will be hosting SLAM on Saturday, April 29th, here in the NMI. We plan to follow in the footsteps of our fall success, so we hope you’ll be there. Stay tuned for more details in the coming months. Interested in sponsoring our Spring SLAM? We would love that! For more information reach out to Megan Ward.